In an effort to properly celebrate Jess (my awesome co-worker) and her birthday last Saturday, I thought it would be a great idea to bring her and her sister to the newly opened Sprinkles Cupcakes (over by the Bloomingdale's flagship store), which happens to be the first location that the popular and famed franchise opened in New York City. It was perfect timing, too, as its first day of operations was the Friday before Jess's birthday! 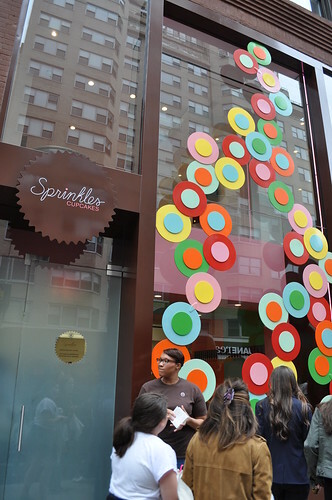 The entrance to this Sprinkles location is covered with couple waves of the signature "dots" superimposed in metallic form along its storefront window. I like how Sprinkles makes its storefronts look different in each location, appealing to the surrounding neighborhood's tastes. This definitely screams Midtown East, for sure! 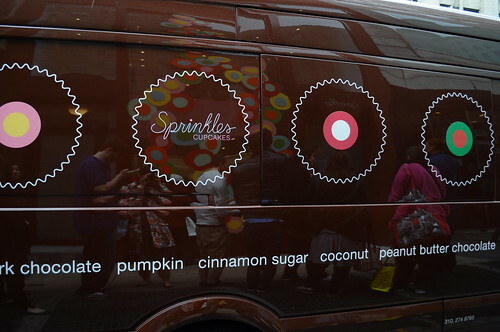 I also had to get a shot of the Sprinkles delivery truck, covered in its logos and assorted flavors while were waiting in line. So cute! Luckily when we arrived around 3:30 PM on Saturday afternoon, the line wasn't too crazy, considering it just opened the day before. From what the Sprinkles associate was telling us while we were outside, it appeared that the line on Friday was about an hour wait to get into the bakery--the madness! We only waited about ten to fifteen minutes until we were inside, and from there, it was only a few minutes. 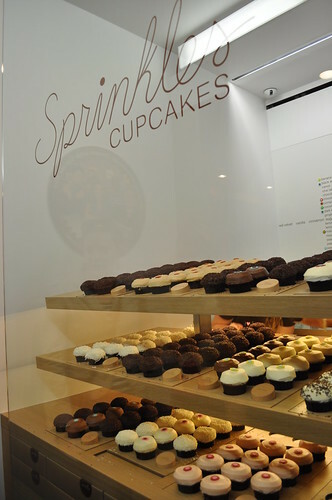 Sprinkles really has the process down to an efficient system as well, so don't expect the wait to be like the one at always seems to appear at the original Magnolia's Bakery in the West Village. 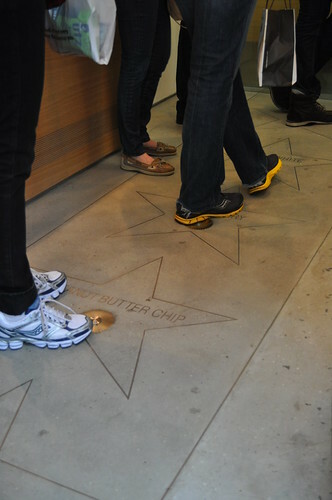 Upon entering Sprinkles, there was a "Hollywood Walk of Fame" for select cupcake flavors on the floor! Here's the glass display of all of the desired cupcakes, all lined up perfectly! Inside the sitting area of the bakery--I love the bright rainbow colors used! 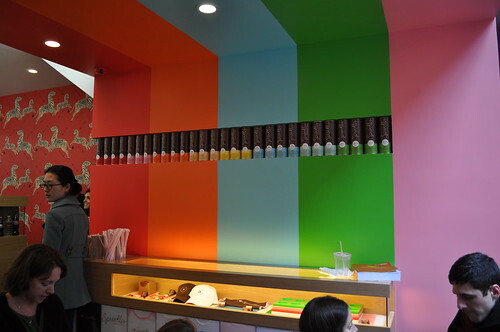 The walls even display the tubes of cupcake mix it has for sale in multiple flavors! 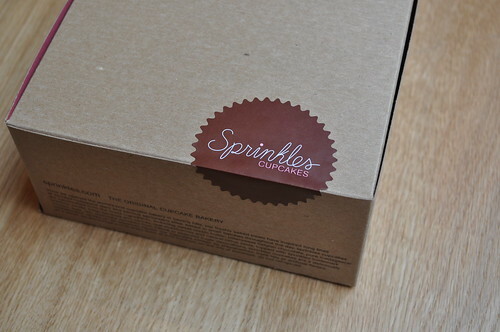 Love the sticker seal on the bakery boxes, too! I went with the strawberry cupcake (top left) made from pure strawberry cake with sweet strawberry frosting on top. I found this cupcake to be really refreshing, and it was the perfect amount of sweet. The frosting felt like it blended real strawberries right into it--you can taste the seeds on your tongue without the seeds actually being in there. A very light cupcake for those who find chocolate to be a little too heavy. Marcus opted for the special flavor of the week, salty caramel (bottom right), a caramel cake with a buttery caramel cream cheese frosting topped with fleur de sel (French for "flower of salt"), as well as the signature red velvet (bottom left), a southern style light chocolate cake with cream cheese frosting. Fleur de sel is a hand-harvested sea salt collected with only the top layer of salt scraped before it sinks to the bottom of large salt pans used for commercial production. Anyways, I thought it was just the perfect combination of sweetness (caramel in the frosting) with saltiness (the fleur de sel sprinkled on top). It did that tangy sweet-and-salty dance happening on my tongue! However, Marcus found the salty caramel to be overly salted. You can see how sporadic the sprinkling of fleur de sel was on top of the cupcake's frosting, probably leading to the uneven dispersion of fleur de sel from a taste perspective, and thus, a slightly unpleasant taste. Marcus's suggestion would be to mix in the fleur de sel right into the butter cream, guaranteeing a more even distribution of the salty flavor throughout. While in theory that sounds quite favorable, I think having fresh fleur de sel sprinkled on top has its benefits as well--perhaps a fresher tasting saltiness. Marcus and I thought the red velvet was awesome! No overhype-age of Sprinkles' red velvet cupcakes. Undoubtedly, it was the perfect amount of cream cheese frosting to match the incredibly moist red-stained light chocolate cake. I just recently learned the red in red velvet cakes typically come from the beetroot used or simple food coloring. Along with the recipes that use food coloring, the reaction of acidic vinegar and buttermilk tends to better reveal the red anthocyanin (i.e., water-soluble vacuolar pigment in the cocoa). 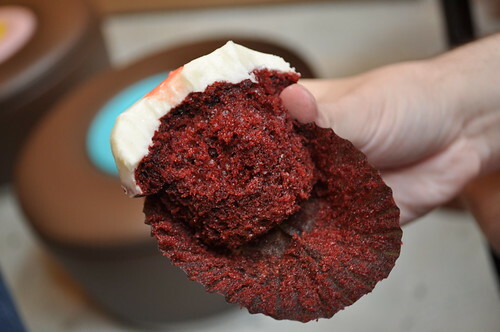 But back to the cupcake at hand--this one definitely takes the (cup)cake for best red velvet I've had to date. Highly recommended! Jess, the birthday girl, went with dark chocolate (on the left), a Belgian dark chocolate cake with bittersweet chocolate frosting, and peanut butter chip (on the right), a chocolate chip-studded peanut butter cake with peanut butter frosting. She reported the peanut butter chip was really great--you could see the chocolate chips mixed in throughout the cake. It was rich in flavor, so you chocolate and peanut butter lovers out there, this is a great cupcake for you. Jess saved the dark chocolate for the next day, and while it wasn't as fresh as it would've been when we got them on Saturday afternoon, she said it was amazing. Lots of bittersweet chocolate goodness throughout, until the very last bite! Jess's sister, Jill, went with the red velvet was well (on the right) and the vanilla, a Madagascar bourbon vanilla cake with creamy vanilla frosting. She found the red velvet just as awesome as we did--just a solid red velvet cupcake. As for the vanilla, she thought it was good also, but not as good as the red velvet. 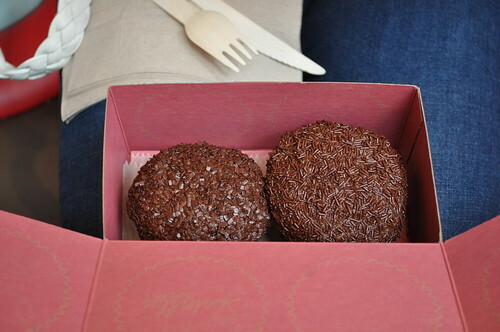 Findings: Overall, I found the new Sprinkles Cupcakes location in New York City to be very good--just as great as the one we visited for the first time in DC. We discovered a new favorite in our cupcake repertoire--the signature red velvet cupcake, moist with the well-blended cream cheese frosting! The flavor of the week, salty caramel, was pretty good--I really liked the concept and how it was executed. From the ones I've tried to date, the frosting/toppings are well-made in that they are not runny or overly thick (almost solid tasting) with the right amount of sweetness to it along with the matched moistness of all of its cake flavors. The great part of its cakes are that they aren't dense--they are very light, making it easy to have a second without feeling too full (unless you are already full from the get-go). 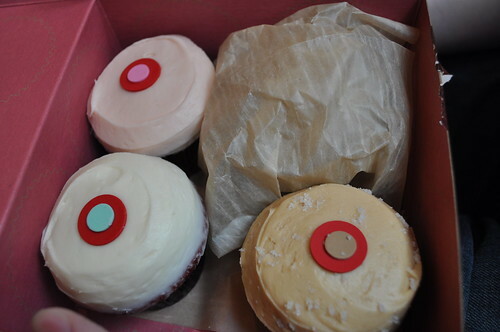 I'm definitely looking forward to having Sprinkles right nearby so that I don't have to wait for my next trip to DC to try a new flavor! Definitely adding dark chocolate on my list along with peanut butter chip and the chai cupcake that seems to be only featured on Fridays. Price point: $3.50 for each cupcake.